We find that earnings sentiment gives investors an edge over consensus. In our latest research, we find that our new earnings sentiment indicator derived from real-time news and social media significantly outperforms consensus estimates, both in terms of Information Ratios and annualized returns. In this study, we consider whether sentiment data about earnings announcements can offer investors an edge when compared to traditional consensus. Specifically, we develop an indicator that extends beyond the “hard numbers” and further considers how a company’s earnings data is portrayed in the news from a sentiment perspective. We find that focusing on earnings sentiment typically yields higher Information Ratios and twice the return when compared to a strategy based on traditional earnings consensus. Our strategies are backtested over an 8-year period across regions and company size. 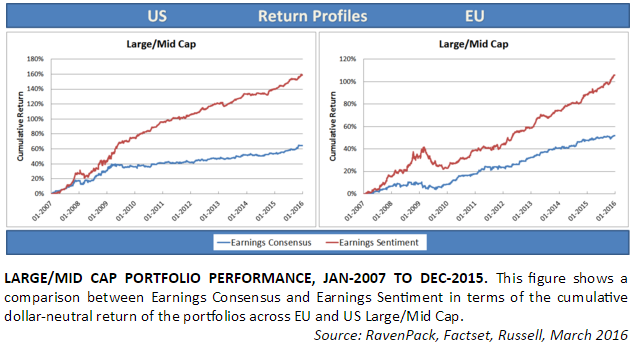 The use of earnings sentiment vs. consensus estimates yields Information Ratios of 2.55 vs. 1.36 across the Russell 1000 and 1.93 vs. 1.45 across the European equivalent portfolio. The outperformance by earnings sentiment is consistent across holding periods of 1 to 21 days; typically resulting in bigger portfolios at a similar turnover rate. Return correlation is low with 26% in the US and 12% in Europe. Tracking company earnings is a key element of any fundamental trading strategy. Often, a shortterm trading opportunity arises following the realization of a company either missing or beating market expectations. Gaining an edge on such information, however, is very difficult since there are literally millions of eyes on Wall Street looking at the same information. In this study, we consider whether sentiment data on earnings related news and social media can offer investors a competitive edge. Specifically, we create an earnings sentiment indicator that we deploy as part of a unique and non-traditional thematic alpha stream. In order to create our sentiment measure, we leverage RavenPack’s Event Sentiment Score (ESS) on news that relates to either earnings, revenues or dividends, i.e. spanning anything from changes to analyst’s estimates or company guidance, to reported figures being better or worse than expected. This allows us to move beyond the “hard numbers” to consider how earnings information is portrayed in the news from a sentiment perspective and how to weigh potentially conflicting information, i.e. positive historical results vs. negative future guidance. Our recent research focus  has been on creating a so-called super-alpha strategy built on top of a set of thematic alpha streams . This paper considers one such alpha stream. Combining multiple alphas has proven to be an interesting angle on portfolio construction and diversification, and has been widely covered in recent literature [3, 4, 5]. In contrast to previous research, where we simply considered the average sentiment by event group, in this study we seek to exploit the more detailed information available at the category level. More specifically, we increase the sophistication of our indicator construction process by tracking the performance of any single category, and filter out the non-performing ones. Even though, in this paper, we focus purely on earnings-related news, the methodology is also applicable to other themes (e.g. Products & Services, Analysts Recommendations, Insider Transactions, etc.). The layout of our paper is as follows: Section 2 explains our indicator construction methodology including a description of the data source that we are using. In Section 3, we analyze the performance behavior across various parameter settings in order to select the historical window size in our model. In Section 4 we show the performance we get with the constructed indicator as a signal and benchmark it against a similar strategy built on top of a standard earnings database. Section 5 summarizes our results.